At the last minute we had a flurry of entries and were oversubscribed! Again we had several players travelling from Bristol, Fiona Harrison from Jesmond Dene, Annabel Wyatt from Prested Hall as well as our old faithfuls from Hardwick, Radley, Petworth and the Oratory. Most of the morning group matches were very tight with the final match, Pam Tomalin and Chantelle Harding v Fiona and Carolyn Armstrong-Smith playing for the wooden spoon, going to 6 – 5. The afternoon group matches were equally as tight with pairings trying hard to hit the galleries to gain the serving end. Through to the first semi final Group A winners Lucy Hutchinson and Rhona Russell (Petworth - good to see you back playing in tournaments) v Group B Runners-up Doris Siedentopf and Julia Kent (Holyport/Radley). Lucy hit some really strong serves and Rhona was very quick about the court producing some excellent retrieving. Meanwhile Doris as soon as she was given the space was quick to slither a return of serve down the backhand sidewall as well as producing some excellent volleying. Although Lucy and Rhona raced to a 4 – 1 lead Julia and Doris played more consistently and clawed back to 4 – 4. Then good serving by both pairs led them to 40 – 40, with Lucy and Rhona clinching the last point. 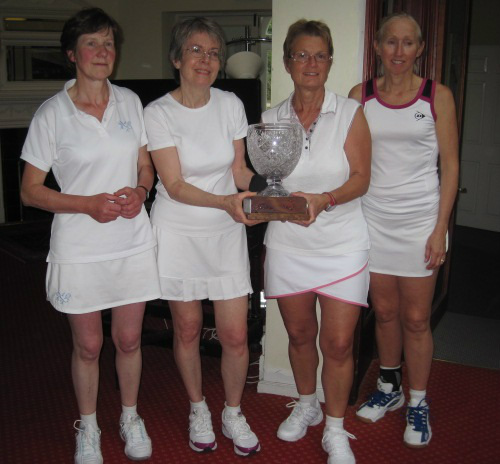 The second semi final was Group B winners Jane Rowlands and Diane Binnie Holyport/Hardwick v Candida Nicholls and Annabel Wyatt (Oratory/Prested Hall). This time it was Candida and Annabel who raced to a 3 – 0 then 4 – 1 lead. Jane and Diane dug in and crept back to 3 – 5 down then at match point down Jane hit some awesome volleys to keep them in the game and 4 – 5. Two return of serves into the dedans helped them get to 5 – 5. Then at 40 – 40 Candida hit a great return of serve so hard at Diane who somehow or other managed to block the ball over the net dropping her racket in the process. Candida going for the kill only managed to hit the ball into 2nd gallery. Still match point. Diane is now receiving and slams an unbelievable return to win the chase and the match. In the final a set to 8 saw Lucy and Rhona giving 17 handicap points away to Diane and Jane! Jane it has to be said is a very seasoned and experience lawn tennis player but has only been playing realers 6 months. However, clearly at the start the tactic by Lucy and Rhona was to play on Diane. This was effective for about 2 games, but frequently when this happens the targeted player gets used to this tactic and raises their game, which Diane did! The pairs traded games, 1 – 1, 2 – 2 and at 5 – 4 to Rhona and Lucy, Rhona hit a superb drive to beat chase a yard and reach a 6 – 4 lead! At this point you might have thought the Petworth pair had begun to have the match sewn up, but no! We have some French cricket volleys from Jane to bring the match to 7 -7 and 40 – 40. Finally, with a great drive by Jane she hit the ball into the nick which gave her and Diane the match and the trophy. Throughout the match Lucy served with great length and variety and Rhona played most consistently but with the handicap and determined play from Jane and Diane they snatched the trophy on the last point. A convivial day all round and thanks go to Chris Bray for marking non-stop all day and Tom Durack for the behind the scenes paperwork. Many thanks too to Jill for organising the tournament and for providing a delicious lunch.